Jennifer Aniston is known for her trend setting hair. Here is how to get Jennifer Anistons honeycomb colored hair. You need to start with a medium brunette hair color as a base. So depending on your hair, this will mean dying it either lighter or darker. Now, to warm and lighten up the hair, add golden highlights throughout. 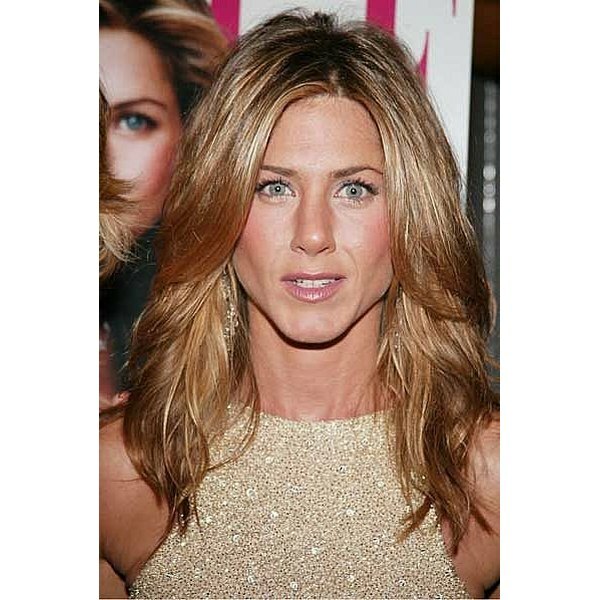 And to really get hair color like Jennifer Aniston, add a few bright blond highlights around the face. Go to a salon for help to achieve this look and bring pictures of Jennifer Aniston's hair along with another item that reminds you of the color, such as honey! This will help you and the stylist to be on the same page! Everybody's hair is different. If you are attempting to do your own hair, do a test strand with a small section of hair from underneath around you neck to see if the color is right. If you have died your hair black or near black, it is a bad idea to try to lighten it back up yourself! I've seen the horrible mess and damage that can result!